This group portrait shows members of the King family in a relaxed domestic setting, seated companionably around a table and posed to reinforce traditional gender roles- the elder daughter assists her mother with the care of a younger child while the father imparts knowledge to his son. Captain King (far right) wears a British Royal Naval uniform (pattern 1795-1812) comprised of a blue wool double-breasted, brass buttoned dress frock coat for a captain (under three years seniority) edged in gold lace with a stand collar, button-back lapels and epaulettes at the shoulder, the sleeves with ‘mariners’ cuffs trimmed with a single row of gold lace to denote rank, worn with a single-breasted waistcoat, over a linen shirt with a high collar, frilled cuffs and a white cravat, and knee breeches in white wool with ribbed stockings. His white hair is possibly powdered and tied-back. Mrs King (far left) wears a full-skirted, long-sleeved white muslin morning dress with a wrap over front, edged with a narrow flounce, forming a V-shaped neckline and tied at the waist over a high-necked white muslin ‘chemisette’, or undershirt. Her bandeau headdress is tied around her natural curls and she wears fingerless mittens. Anna (aged 6) and Elizabeth (aged 2) wear day dresses of white muslin with low necklines, high waists and short, puffed sleeves; the younger daughter also wears a [straw] cap trimmed with a red sash. Phillip Parker King (aged 8) wears a brass-buttoned, blue wool jacket over a white double-breasted vest and a linen shirt with a wide flat collar trimmed with a narrow flounce. 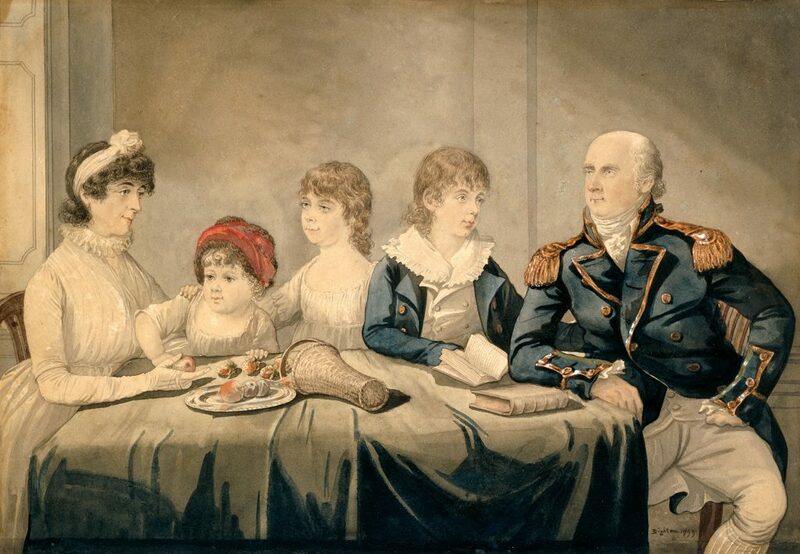 Philip Gidley King (1758-1808), his wife Anna Josepha (1765-1844) and daughter Elizabeth (1797-1856), then their youngest child, left England for NSW in 1799. Captain P.G. King had received his post-captain’s commission on 5/12/1798, and was appointed third Governor of NSW (1800-1806). The King family were not reunited with their two elder children, Anna Maria (1793-1852) and Phillip Parker (1791-1856), until 1807. It seems to have been common practice for officers departing for overseas service to have a portrait made, though family portraits like this one are less common. Robert Dighton (c.1752-1814) was an English portrait painter, printmaker and caricaturist who was regularly commissioned to paint portraits for military families.